I’m so pleased to announce that I’ve been awarded a ‘Personal Trainer of the Year Gold Standard Fitness Award’ by Optimum Nutrition! This can be credited to all our clients amazing work and commitment with us. From a Team GB Mind Body Coach, to a community instructor who gets over 100 locals moving each week, Optimum Nutrition is proud to acknowledge these outstanding fitness professionals. 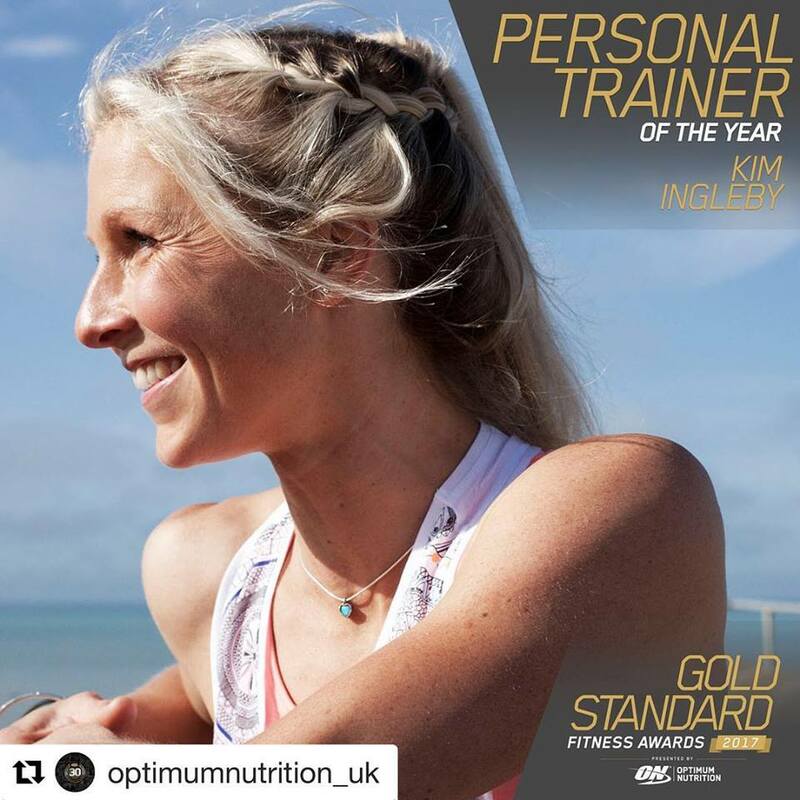 Kim Ingleby, has set the gold standard in personal training, with her inspiring Mind Body Coaching company, Energised Performance. Her clients range from a variety of backgrounds including Team GB athletes, first time runners and overcoming injury. Kim has demonstrated leadership in the wellness industry by using an innovative combination of fitness, DNA testing, Neuro Linguistic Programming & nutrition to help her clients unlock their potential and achieve health and fitness goals. Over 100 fitness professionals entered the now annual Gold Standard Fitness Awards online which is in its second year. Each category was judged based on demonstration of leadership, innovation and success within their profession. The winners were selected by high profile fitness industry experts including; ON athletes Shaun Stafford and Carly Newson as well as international fitness trainer and presenter, Fitzroy Gaynes, Fitness and Nutrition Lecturer and Course Developer Richard Schrivener and Personal Training Director, Chris Walton. Optimum Nutrition (ON) is one of the most highly regarded sports nutrition brands in the world. For over three decades, Optimum Nutrition has continued its mission to deliver sports nutrition products of the highest standard to help athletes achieve their goals. For those who consider improving physical performance and their physique a never-ending mission, Optimum Nutrition is a trusted partner for achieving ambitious goals. Since being founded in 1986, Optimum Nutrition has been setting the Gold Standard in supplements, and now distributes in over 130 countries and represents the growth that is symbolic with the evolution of the sports nutrition category. For PR Enquiries please contact Mongoose Sports and Entertainment at optimumnutrition@mongooseagency.com. For 1:1 VIP Empower Coaching pop me an email kim@energisedperformance.com. To join my Exclusive Make 2018 Brilliant Mentoring Year click here: http://www.energisedperformance.com/checkout/success-confidence-club. And for special priced DNAFit Tests and Consultation, order here: http://www.energisedperformance.com/checkout/dna-pro-fitness-test.